Please welcome to LookingCloser.org a guest reviewer who has been corresponding with me about movies and film criticism for years: Daniel Melvill Jones. The world has overwhelmed Ruth (Melanie Lynskey). She’s resigned herself to a lonely routine of nursing dying patients before coming home to her ramshackle house in a working-class Portland neighborhood. When a particularly mean-spirited patient of Ruth’s dies with a racist curse on her lips, and Ruth comes home to find her house robbed of her laptop, anti-depressants, and her grandmother’s silver, her slow-building crisis reaches a breaking point. 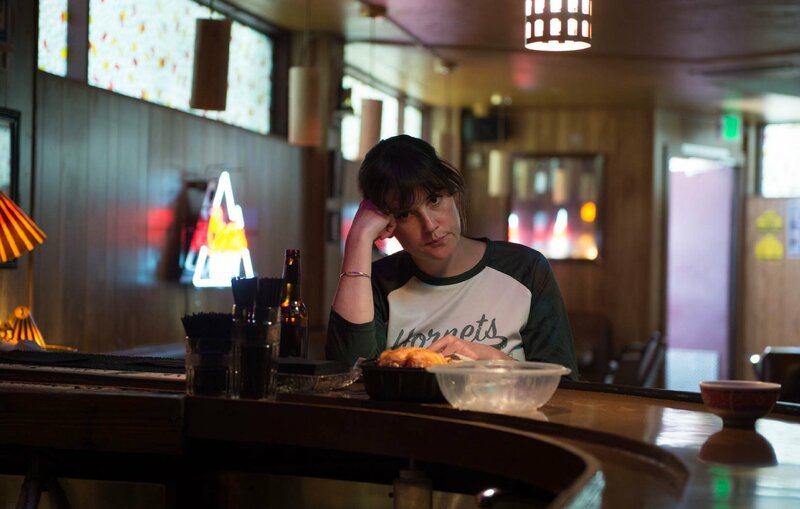 Melanie Lynskey as Ruth who isn’t going to take it anymore. Those are the opening 10 minutes of the Netflix exclusive I Don’t Feel at Home in this World Anymore — Macon Blair’s directorial debut and winner of this year‘s Sundance Grand Jury. They articulate both Ruth‘s emotional state and the film‘s central dilemma. Ruth sees herself surrounded by assholes, so why does the world reward them instead of her? If this is all there is, how is she to respond to such absurdities? It’s a not-so-beautiful day in the neighborhood. With a stubborn determination rising underneath her timid exterior, Ruth realizes that the police detective (Gary Anthony Williams) is treating the crime as a standard case rather than a personal offense. If justice is to be served, she will have to be the initiator. This includes confronting one of the assholes in her life — a neighbor whose dog keeps pooping on her front lawn. 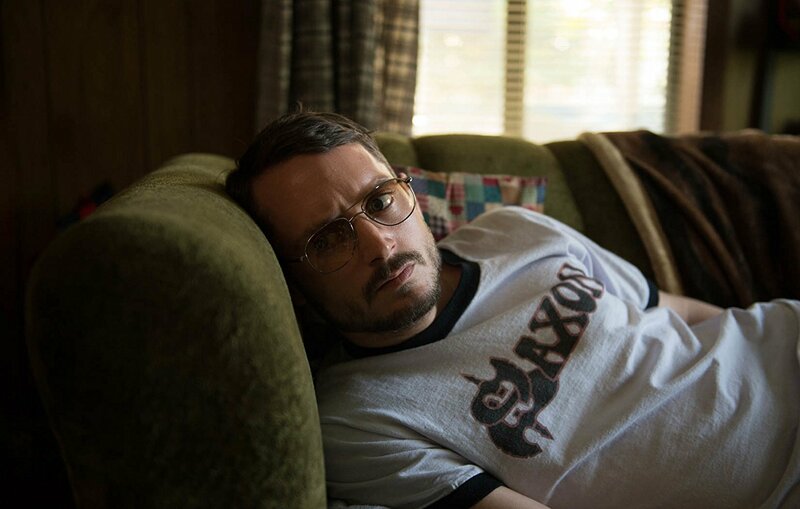 And so we meet Tony (Elijah Wood), who arrives fully formed with his backstory leaking out through details, like his obsessions over ninja sticks and nut milk. His barely contained rage is controlled through backyard weight lifting and devoted churchgoing. He is quick to surrender this bristling exterior, revealing a tender conscience and an earnest poise. After awkwardly apologizing for his dog’s bathroom habits, he hears her story and joins in her outrage. Elijah Wood is Tony. He’s odd, he’s skilled with throwing stars, and he may be Ruth’s only hope. As Ruth and her new friend are drawn into a wider world of desperate drug addicts and miserable trophy wives, events spiral out of control. We‘ve previously seen Blair in front of the camera in Jeremy Saulnier‘s Blue Ruin and Green Room. As a director, he borrows those films’ mounting danger and knowledge of America‘s grim underbelly. But these darker elements are balanced by Blair‘s endearing characters and quirky sense of humor. He makes deft use of the film’s 93 minutes, getting mileage out of minor incidents and reusing seemingly thrown-away props — like a plaster of Paris footprint cast — to propel the story forward. In Ruth’s eyes, she is the only victim in a world of ungrateful bastards who are constantly taking from her. But as her story expands into the backyards of her eclectic neighbors, the dripping forest campsites of the homeless, and crusty pawnshops of those on the fringes, she is sucked into their lives and learns that her desperation is felt by the poor and the privileged, the decent and the destructive alike Her pain is just a small part of world‘s sufferings. And through her self-righteous quest for her own justice, she becomes complicit in a sequence of violent and ultimately tragic events. Introducing “the criminal element” (played here by Jane Levy and David Yow). What then is the right response to such a cold world of grief and greed? In Tony, we see someone who is in many ways similar to Ruth. He is far from perfect, often too lost in his own world to notice his impact on others. But something inside of him flinches at the wrongs she commits. There is a permanence to his life that can‘t be explained by mere gas and carbon, suggested visually in several strange scenes, each lit with warm backlight. In Blair’s vision, the world is a haunted place containing a swift and terrible inertia. The score’s lush synths, funky rhythms, and mounting electric guitar chords play an important role in coloring this environment. The story is self contained, an entertaining ride but revealing few additional insights on a second viewing. There are hints towards a higher hope, yet these glimmers can’t quite escape the growing sense of inevitable loss. 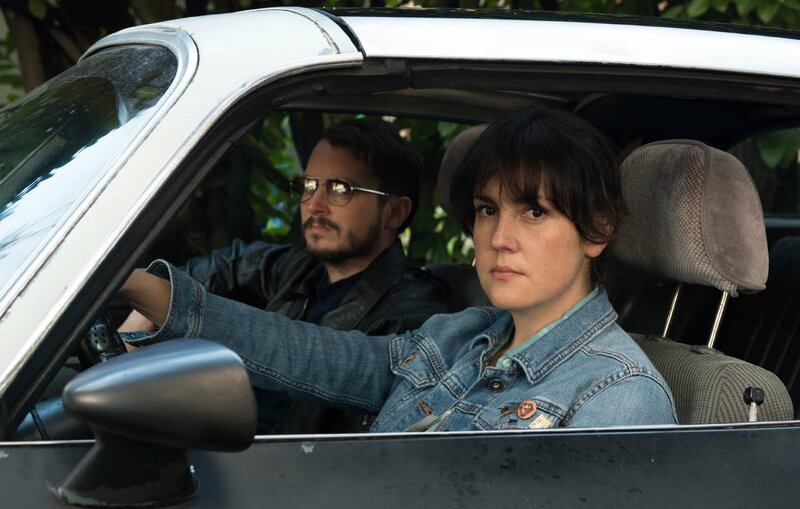 Does the bloody conclusion of I Don’t Feel at Home in this World Anymore answer the dilemma articulated so eloquently at its beginning? Ruth expands beyond herself. In encountering Tony, she experiences someone with a conscience shaped by a devotion to a higher power. By entering into the messy lives of others, Ruth becomes less sure of her own self-righteousness; but not before learning the consequences of wielding a sharp blade. In the endless rows of Netflix, this quirky thriller is worth seeking out. What I really loved about this movie was balancing act between conscience and action. How far is too far? She finally snaps when she figures out that her “appropriate” action would yield absolutely no results. The transition to “I know this is wrong and I’m no longer morally justified” is a fascinating one. And it’s also fascinating to recognize that transition as audience. At what point do we go from rooting for her to feeling uncomfortable over her actions?